In our December reading for the second Sunday of Advent we find John the Baptist in the wilderness doing what John is given to do. He is warning about the coming wrath of God and calling on people to repent. John preaches an urgent message of repentance because, Luke 3:9 (ESV) 9 Even now the axe is laid to the root of the trees. Every tree therefore that does not bear good fruit is cut down and thrown into the fire.” If you remain in evil living and sin, God is going to come and cut you down and throw you in the fires of Hell. You think John is tough? Jesus is coming with the winnowing fork to separate the good from the evil. A winnowing fork is used to separate the good kernels of wheat from the useless chaff. God is coming in judgment and wrath to burn the chaff. This is John’s message. Turn from sin. Repent! Before it is too late. John brings this message to the people at the Jordan River. He also brings this message of impending judgment to Herod the Great’s son, Herod Antipas, who divorced his first wife in order to marry Herodias, his brother’s ex-wife. John brings them God’s warning to repent and Herod and Herodias shut John up by having him arrested and put in prison. Herod did not want to be warned about his sin. I believe that remains true today; people do not like being warned about their sin. Folks get proud of their sin; it becomes part of their identity. Not at first. At first you feel bad about your sin, but then if you continue to practice the sin, practice makes perfect. And then you come up with the justifications and reasons that you make work for you to explain your sin; to excuse your sin. And if you stay in your sin long enough you start to grow proud of your sin. And then if someone has the audacity to warn you about your sin you get offended. How dare they? Who do they think they are to judge me? Who are they to tell me not to move in with my girlfriend? What are they thinking to tell me that I am drinking too much? Who made them judge to tell me that I have been missing Sunday worship way too much? Who are they to tell me to stop….you fill in the blank? It is not easy to warn someone of their sin. It is a difficult act of love to go to someone and warn them that their persistent sin is putting them in spiritual danger. It is not easy because we do not like to be told that what we are doing is wrong even when we know it is wrong. Here we are this morning with the message from John the Baptist to repent! Turn away from sin and bear the fruit of good works because if you do not, you will be cut down and thrown into the fire. And if you think John is bad, the one coming after is so much worse. It is a troubling message because how do you know if you have repented enough? How do you know if you have produced enough of the fruit of repentance? And then Jesus appears on the scene. In our reading from Luke it seems that Jesus is just another one in the crowd who is baptized by John in the Jordan. But Jesus is not just another sinner coming for the baptism of repentance. Jesus is the sinless Lamb of God. Jesus is God in flesh; God with us. Jesus is without sin, so Jesus does not need to repent. Jesus does not need to worry about the coming wrath of God. Jesus arrives, but not with the winnowing fork; not yet. Jesus comes not to separate the wheat and the chaff, but to identify with the chaff; to save the chaff. Jesus identifies with sinners in order to pay for their sins and open a way to heaven for them. Jesus takes upon Himself the baptism of fire on the cross so that in your baptism you are brought through the waters to Promised Land of the Kingdom of Heaven. Jesus is baptized into your sin so that Jesus opens the way of eternal life for you. Jesus tears open the door of heaven for you. Jesus is the way to eternal life. That day at the Jordan River Jesus is being anointed to be the Messiah by water and the Holy Spirit. The heavens are opened; just as the heavens are opened at Jesus’ transfiguration. Just as the curtain in the temple is torn open after Jesus crucifixion. Just as the eyes of the disciples are opened in Jesus’ breaking of the bread on the road to Emmaus. After Jesus’ baptism, the Holy Spirit descends on Him like a dove confirming His anointing as the Messiah; the Christ; the chosen one. This proof of new life in Christ hearkens back to the dove bringing to Noah evidence of new life. It shows how you receive the Holy Spirit at your baptism, giving you faith, and setting you apart from the multitude of unbelievers. The voice of God announces, Luke 3:22 (ESV) 22 … “You are my beloved Son; with you I am well pleased.”  Jesus has been anointed and has begun His sacrificial mission to the cross and God is well pleased. Just as in the beginning of creation when God; the Father, the Son and Holy Spirit are together with the Spirit hovering over the waters, they are all together again here at the Jordan River. 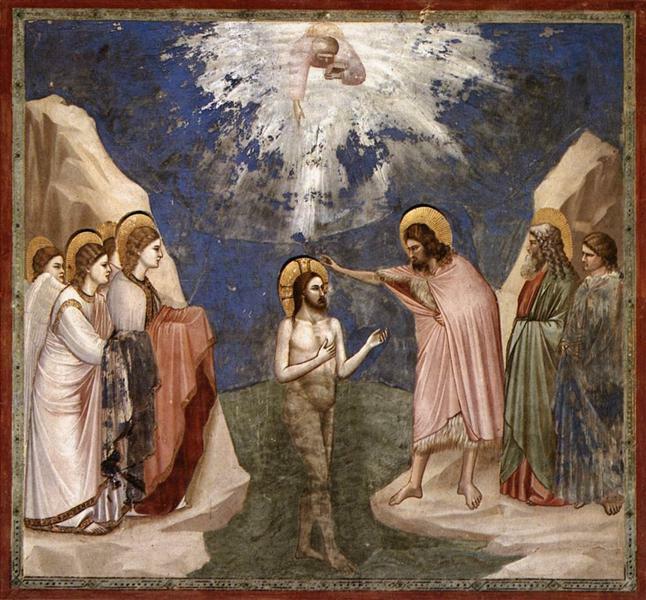 Jesus’ baptism is clear evidence of the Trinity; the Trinity into which you are baptized, “In the name of the Father and of the Son and of the Holy Spirit”, which we remember and invoke at the beginning of worship. Jesus is baptized in the water to be anointed to undergo the bloody baptism of fire on the cross in order to bring forgiveness to you; in order to wash away your sins like the waters of the great flood cleansed the world of evil. Jesus is baptized so that He can save you. Jesus is baptized in the fiery wrath of God so that in your baptism you are saved from that wrath.